Signed W. Koeniger, lower right. Known for his paintings of snow-covered landscapes, Walter Koeniger lived most of his life in the Catskill Mountains of New York state. He spent his thirty-year career sketching and painting frozen water scenes around his home. Little is known of him before he began painting in the United States except that he was born in Germany and showed early art talent, but his parents directed him towards architecture. No record has been found if he had architecture training, but he studied painting under Duecker and von Gebhard. He arrived in America around 1910 and became a part of the Woodstock, New York artists' colony in 1912 pursuing what writer G. Frank Muller called “the moods of nature and the soft graduations of violet, purple and deep blue”. He was not committed to any style but painted what he saw in a way that combined realism with impressionistic application of vigorous, broad brushstrokes. 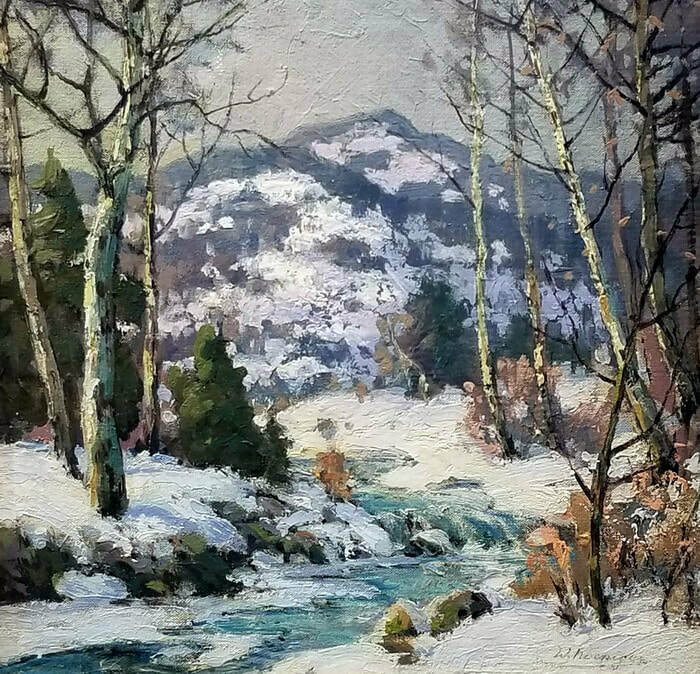 A plein-air painter, even in winter, he used fresh, glowing colors to convey the crisp, vigorous mood of his settings. In the painting “Winter Landscape” featured on this page, the right side of the canvas is bathed in a soft warm glowing light typical of early New England afternoons in the late winter, while the left side of the canvas is painted in complementary purples and greens, adding to the excitement of a swift moving stream flowing predictably with the ongoing season’s snow melt. Between 1926 and 1931, Koeniger exhibited many of his winter landscapes at the National Academy, NYC annual exhibitions. His works were popular and were sometimes used on the covers of "Literary Digest." Later in his life, he kept a studio in New York City as well as Woodstock, and he painted until the time of his death in 1943.